I've noticed my dill has been depleting every day but I never really gave it attention. Today I look at it and it was barely there and there are little black worms on it. What are they and how do i get rid of them? Probably but not for too much longer as whatever laid the eggs will think it has reproduced enough and go off somewhere and die. Try and keep an eye out for moths/butterflies etc. that land on it so you can identify your culprit. Always good to know your enemy. Franco. Stop squishing a minute. I just checked and the main pest on Dill is Swallowtail butterflies (well caterpillars) in your case. Do you have them there? I don't know if these are their caterpillars or not so go and buy another Dill and let them have one while you have the other and see what you end up with. Would be a shame to kill them. They are so beautiful. beautiful they may be but i want my dill! Yes. These are black swallowtail caterpillars. How come they are in your garden not in my garden? I have planted a bunch of carrot tops for them. If you have a lot of dills, yes, they will come back. They are very hungry critters. I would've been squishing them too! Franco, go get another dill, keep it well away from this dill. 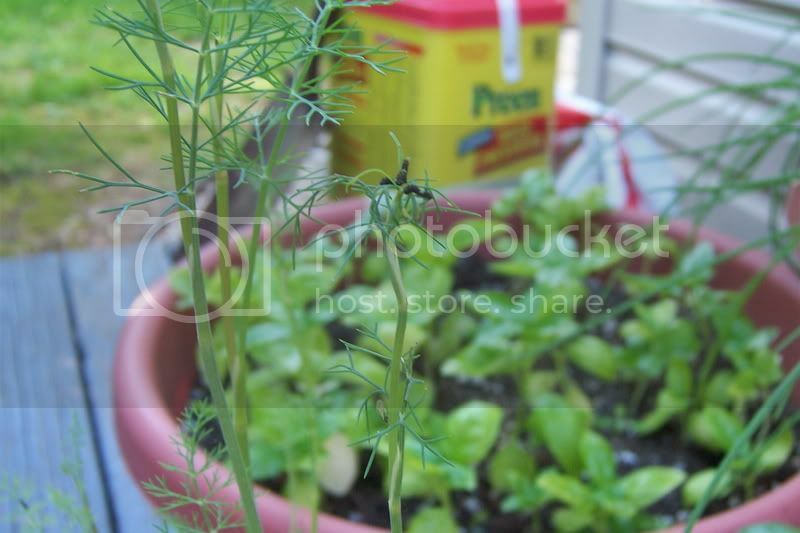 If you find a caterpillar on your new dill, then move them to the "free munchie" dill. I do know how you feel tho, franco. That's YOUR dill, and this critter is eating it! The audacity! I get a little peeved too. You have just learnt a very good lesson in organic gardening. Let live if at all possible. Many species of butterfly are now on the endangered list or becoming more rare as their natural food source is diminishing (stinging nettles in Britain for example) or the caterpillars are being killed by whatever method (usually pesticides). Every living thing is there for a reason whether it be a food source or a predator. If you knock out a link in a food chain then ultimately the chain collapses affecting several species not just the one. I will get off my soapbox now. It's not a bad soap box to be on, Jess. Anybody else rarely see lightning bugs anymore? Our neighborhood used to glitter with them at night, they were so plentiful. Now I see maybe one or two a night, that's all. Pesticides are not their friend. You may have temporarily gotten rid of the mealy bugs, or the spider mites, or the hornworms... but pesticides kill indiscriminately, and butterflies, dragonflies, ladybugs and fireflies are killed just the same. I've noticed the decline in lightning bugs here too, over the last ten or so years. I also noticed one good increase--Monarch butterflies. I had a few stand-alone Asclepias plants out by the road, knowing they were part of the "chain", but never saw one. Then when I got sick and had to ignore my garden the Asclepias appropriated a patch near the front door, darn near smothering the Yuccas. Well, by golly, I've had Monarchs, caterpillars, but no chrysali (chrysalises?). I think the birds may have gotten them. But I saw many Monarchs and a few black-and-blue jobs, and all by my front door! How cool is that? So, note to self: If ya want to plant a plant to attract something, try not to be so stingy and plant a plot of plants! They look a lot nicer after they shed their skin a couple of times and get bigger. If you don't have enough Dill to feed them, they'll eat your plant down to a nub of a stem and starve. If you have fennel, rue or parsley nearby, they'll eat that too. I understand that you want your dill; I love it in chicken soup, but the butterflies are absolutely beautiful. Perhaps you can plant extra herbs so there are some for you and some for the butterflies? My mom and I both plant dill, and when one of us gets too many caterpillars, we just share them. She also exchanges numbers with butterfly minded gardeners she's found at our local native plant shop, so they have a small phone network of caterpillar sharing - it's a good way to get the caterpillars you want, and get rid of the ones you don't but still give them a good home for the brief couple of weeks it takes them to grow up and make a chrysalis. There are photos of the butterfly and caterpillars on that page - it is a big pretty butterfly. Franco, I had Black Swallowtail Butterfly caterpillars once, but haven't seen any in ages. I hope your butterflies find my plants instead! Since you want your dill, one other way to get rid of them is to find a person who works with kids, like a teacher, who will take them for a class project so the children can learn from watching the butterfly life cycle and have their own butterfly release when they emerge. Want aphids with that dill?